Plant description: Acqua & Sole treats more than 120 000 ton of sewage sludge and aggro-industrial waste per year. Besides bio gas, Acqua&Sole produces various ammonium sulphate, organic fertilisers and organic soil improves with a range of nutrient contents. Ammonium sulphate is used as a feed stock for the production of N fertiliser. The organic soil improves are applied in the nearby region. Soil improves have many beneficial effects on soil quality and contribute to the sequestration of carbon in soils. Low carbon contents are problem in Italy, especially in the southern regions of Italy are soils are prone to the loss of organic matter. The produced soil improves are valuable resources to overcome this problem however, despite its positive agronomic effects, disposal of sewage sludge on land has a negative image and is considered as a disposal action rather than as a useful application. Besides, the high N-content of the organic soil improves limits the amount of organic matter that can be applied because of restrictions on N-fertiliser application to soils. Innovation: Acqua&Sole will, in close collaboration with UMIL, implement and demonstrate a novel N recovery absorber which enables Acqua&Sole to recover N in a mineral form and to reduce the N content of the organic fraction. Two enhanced organic products will be tested: (i) a soil fertiliser with adjusted nutrient contents in order to meet criteria of rice producers and (ii) a soil amendment enriched with rhizobacteria that promote plant health. Products & Benefits: The N-reduced organic soil improve can be used by farmers in the nearby region as a resource of organic carbon without exceeding limits for N-application. 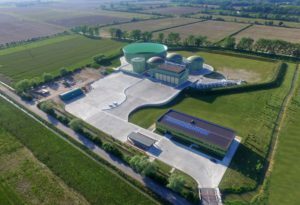 Acqua&Sole will also improve the image of bio waste by demonstrating that its products are free of undesired contaminants and pathogens and by demonstrating the agronomic performance of the products in large-scale field trials.